By a show of virtual hands, how many of you saw the newest Top Gear episode that aired over the weekend? The Japan episode? Was your mind blown? Because mine sure was. To recap, this episode was very much in line with past Top Gear specials in that it didn’t really follow in the traditional Top Gear format. There was no celebrity segment or hot lap segment. Instead, we were treated to an hour-long program devoted wholly to an examination of Japanese car culture by Chris Harris, Rory Reid and Matt LeBlanc. It was good. We started off with a segment where a Lexus LC500 and Honda Civic Type R went head to head against each other at the track. Then Harris and LeBlanc were given a challenge to each buy a cheap, used, ’90s-era Japanese car at auction and then complete a set of challenges with it. Reid, meanwhile, went off on his own to experience some underground Tokyo car culture. To begin, the animated visuals in the Lexus vs. Honda episode were killer. The stylized opening reminds you of an arcade racing game and the quick, anime-ish cuts of the cars make you feel like you’re watching a clip from Akira. And the bits where LeBlanc and Harris get to visit an auction house in order to choose their ’90s Japanese sports car felt like watching Christmas come to life on your screen—especially as an American seeing all those Nissan Skylines parked neatly side-by-side. Rory Reid’s night-long adventure through the streets of Tokyo was one of the most visually immersive Top Gear segments to date, where he explored the culture of kei cars, hung out with the local Lamborghini club, met up with some Bosozoku owners and ended the night by driving a street-legal Porsche 962 through the mountains. And finally, the show was granted special access to take us through the Fukushima Exclusion Zone. It was a sobering and absolutely haunting segment, seeing how life in a town just stopped at the precise moment when everyone was evacuated. You could feel it through the entire episode. Sometimes it took the form of quiet admiration and others, it was an incoherent yell of pure exhilaration and awe. But it was there: This celebration of and reverence for Japanese car culture and everything it had to offer. And even as outsiders, you could tell that the hosts were truly overwhelmed by what the country had to offer. Traditional car media that you and I experience is largely very Anglo-centric. This includes television shows. They usually take place in Western and European countries. Rarely do they branch out to incorporate Asian countries and the car cultures that exist there. That’s not to say that Top Gear hasn’t done it before. In the past, the show has gone to Japan, Vietnam, India, Myanmar and China. But the experiences that it projected largely had to do with poking fun at the local customs, highlighting certain negatives while ignoring the positives. The overtly British, imperialistic undertones got old very quickly. This third episode is precisely what I wanted in an ideal Top Gear episode. It brought me to a foreign country that I knew very little about and showed me the best of what was there, without interjecting weird and misplaced exoticism in the jokes. It felt like you actually got to savor aspects of car culture that don’t always get the necessary attention in Western media and it was great. It felt genuine here. And it’s kind of Top Gear’s duty to do so, at this point. When you have the massive audience reach that they do, you can take them literally anywhere in the world. You can show them anything. So why keep showing them things they’ve seen before? We don’t need another trip to the Nürburgring. And honestly, I am so tired of hearing the story of the Ford-Ferrari rivalry. Instead, show me where drifting was born. Tell me about pockets of Japanese car modding culture that toe the line of legality. Take me to see the abandoned cars in a nuclear exclusion zone. Teach me something that I didn’t already know. This ethos of expanding the types of things Top Gear covers has been brought up before. Reid, in an interview with Jalopnik earlier this month, said that part of what the team wanted to accomplish for Season 25 was to appeal to a larger audience of people who aren’t necessarily die-hard gearheads. They wanted to show us incredible locations and the unique car cultures that exist there. By doing so, they have make Top Gear more captivating to more people. There are two ways we can run with this. 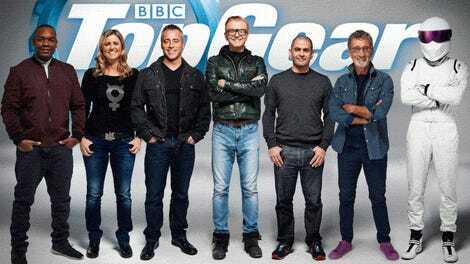 One, we can get frustrated that the new crew is shaking up the known and recognized tone and formula of Top Gear (in which case I would point you immediately to another show). Or! We can recognize that we are going to start seeing some really far-out car stuff that we haven’t even heard of before. We might not even be comfortable with all of it.